World Champion status in the boxing world may elude versatile heavy-hitting Super Featherweight Tiara Brown, for the time being, but she was recently named Officer of The Year for the Metropolitan Police Department in the nation’s capital. Per an Instagram post dated March 20, Officer Brown received the ultimate acknowledgement of her commitment to her duties as a civil servant at the MPD’s Annual Awards Ceremony, and was presented the award in front of fellow officers, friends and family. Brown’s story garnered national attention after being referred to as a ‘real-life super hero’ during a segment where she was honored on daytime television’s popular The Steve Harvey Show. 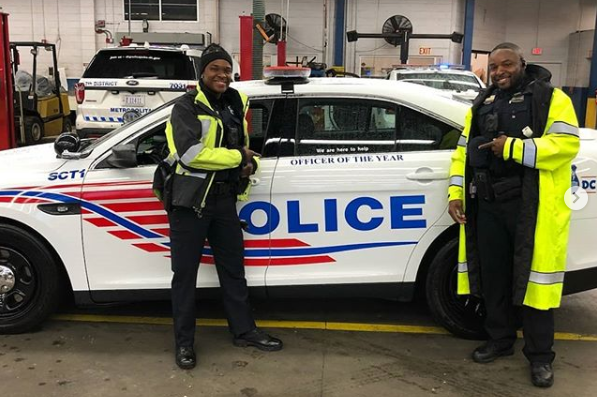 Local news outlet WUSA 9 also profiled Brown, detailing the way she juggles life as a full-time police officer while maintaining her push towards a world title fight in boxing. WUSA 9’s Megan Yoder reported many of the highlights among Brown’s world-class amateur accomplishments. “In 2009, she competed in the USA Boxing national championship as a junior in college and went on to win gold in 2012, 2013 and 2015. In 2012, she won gold at the International Boxing Association amateur championship in China and fought in the Olympic trials in 2015. Originally hailing from Fort Myers, Florida, Brown (7-0, 5 KO’s) last entered the ring back in December to face Dominican Dahiana Santana (36-11, 15 KO’s) at Bowie State University in Maryland. She stopped the former International Boxing Federation Featherweight champion in four rounds. Undoubtedly, Brown – nicknamed the Dark Menace – is eager to return to the ring for her 2019 debut, and her commitment to remaining prepared is unquestioned. A recent announcement of a noteworthy event in the region should make her promoter DiBella Entertainment’s job easier to get her a fight. Lou DiBella can’t sell Officer of The Year to Premier Boxing Champions, and convince them a Brown bout will help sell tickets for the forthcoming “Swift” Jarrett Hurd vs Julian “J Rock” Williams Super Welterweight world championship fight scheduled for May 11 at the EagleBank Arena in Fairfax, VA? That event is a fitting setting for Accokeek, Maryland’s undefeated WBA and IBF champion Hurd, but an awesome opportunity to showcase Brown’s talents in the ring. This event’s turnout could benefit from the local resident’s familiarity with Brown, as she stays active among the local church community, in many of the area’s gyms, and the time she willingly contributes to a host of local charities such as D.C.’s Humane Rescue Alliance. If Brown is unable to get a spot on the undercard of Hurd-Williams, check in with the future champion on her social media to see whose life she’s positively impacting, observe her daily gym grind with her male stablemates, or to receive a word of heartfelt encouragement.